Axed Harley Replacement Tanks For Sportsters. They have early cam-style gas cap bungs, and internally threaded bungs on the right-side for 3/8 NPT aftermarket or HD petcocks. Petcock will be on the right side of bike when installed. All tanks come with a bare metal finish, and have been pressure tested. CENTERLINE HOLE-TO-HOLE OF MOUNTING BRACKETS: 16.81. 1 Gas caps are not included. 2 Always fit and test gas tanks before painting. 3 All gas tanks should be mounted on leather and/or rubber spacers or bushings. 4 On the dual cap tanks, the left-side bung is a non-functioning filler, and uses the same vented gas cap as the right-side bung. 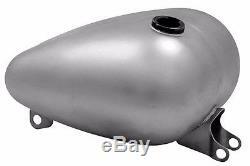 The item "Paughco 4.2 Gallon Axed Gas Tank 1957-1978 Harley Sportster Bobber Chopper" is in sale since Saturday, May 27, 2017. This item is in the category "eBay Motors\Parts & Accessories\Motorcycle Parts\Body & Frame\Gas Tanks". The seller is "americanclassicmotors" and is located in Zieglerville, Pennsylvania.